Proposals to build the first new concert hall in Edinburgh for more than 100 years have been backed by planners ahead of a hearing by councillors. Planning officers from the city council have recommended permission to build the Impact Centre be given the green light next week. 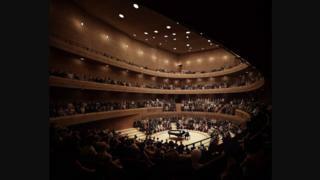 As well as the 1,000-seat auditorium, the centre will include a 200-seat studio and conference rooms. The open foyer will host music performances and a cafe bar. The proposals will be considered by the development management sub-committee next Wednesday. Officers said that the Impact Centre "would make a valuable contribution to the city's cultural infrastructure and provide opportunities for its use by the wider community". The Impact Centre, behind Dundas House at St Andrew Square, would also become home to the Scottish Chamber Orchestra and would be used as a venue for the Edinburgh International Festival. Sir Ewan Brown, chairman of Impact Scotland, said: "We look forward to presenting the case for Edinburgh's first purpose-built music venue in over 100 years to the committee. "This is an opportunity for the city to raise its game in terms of cultural infrastructure and provide a world-class venue for the people of Edinburgh and its many visitors."